I made this over the weekend. I was so excited to cut into it for breakfast the next morning too. When I took a bite out of it the next day, it was mush. Funny how it looked fabulous when it came out of the oven. What happened here?! Cakes aren’t supposed to have a soggy and wet texture! I was sooooo disappointed I was going to chuck it in the trash. There goes a wasted day. Chris, however, liked it. He said it tasted like a bread pudding. I rolled my eyes. He ended up taking it with him to work to share. I was somewhat embarrassed but whatever! I spent yet another day baking on Sunday. This time, I decided to go with something easier. I love muffins and I love baking them. That I know I won’t screw up. And I didn’t, yay! I LOVE this recipe. Oreos and Biscoff –yummy! And a great combination! But be careful. This makes a big batch. Don’t end up eating it all. Have a great rest of the week! Preheat the oven to 350 degrees F. Line two 12-cup regular muffin pans. In a medium bowl mix together flour, baking powder, baking soda and salt; set aside. Using a stand or electric mixer (or mix by hand) cream butter and sugar until fluffy. Beat in egg, then vanilla extract and Biscoff until creamy. Add in yogurt and milk. Continue to beat until combined, scraping down the sides of the bowl. Slowly add the flour mixture into the Biscoff/yogurt mixture and continue to mix until just moistened. Fold in the mini Oreos. Spoon batter into the lined muffin cups (I used a 3-tablespoons large cookie scoop). If using the additional crushed Oreos, sprinkle them on top. Bake for 18-20 minutes or until toothpick/tester inserted into the center comes out clean. Cool slightly in the pan before transferring them to the cooling rack. These muffins have turned out perfect! It’s a cookie (speculoos‬) spread. I was just going to post the same question – I’ve never seen it here in the States. And – your muffins look great ! Muffina are, actually, great things. They don’t need to be cut, they’re portable and they’re yummy ! I think I’m gonna look for a recipe I haven’t made in a long time called Tropical Muffins. And I just remembered another recipe for breakfast muffins, which I also haven’t made in a long time. Thanks for motivating me with these great muffins! I’ve learnt something new today as I had to Google ‘biscoff’ 😉 Now I know it’s a speculoos type spread I can appreciate how wonderful these muffins must taste! Thanks for sharing the recipe. I always look forward to your muffin recipes, Anne! The photos alone make me want to get in the kitchen and bake up a batch! I love biscoff and can sit with a spoon and eat it right out of the jar. I’m going to bookmark this one because I know my son will be so happy to have these in the house. Thank you! Anne, we were on vacation in California and I finally tasted a biscoff cookie. As I suspected, bad idea because it is gooood stuff! My 8-yr old loved it. Yikes! It’s so funny how our husbands can change our mind on how we look at our creations. My husband has done the same! These muffins look amazingly delicious! I love oreos (who doesn’t). I have never tried biscoff…I need to jump on that band wagon because I’ve seen so many wonderful recipes like this one using it. My kids would dig these! Oh I can’t wait to try this – looks beautiful! Oooooh, you just gave me a great idea…oreo and biscoff dough ice cream! cha-ching! These muffins are full of happiness, I can’t wait to get my happy fingers on some! Thanks for sharing! Wow! Biscoff (or Cookie Butter) in a muffin with crushed Oreos on top? I’m in! Your hubby sounds like mine, always seeing the proverbial “silver lining” when it comes to food. Hahaha! Thanks for sharing, Anne! You had me at Oreos! Anne! These look great. Love the color contrast. What a nice tasty treat. Even the apple cake looked great. Have a great day. 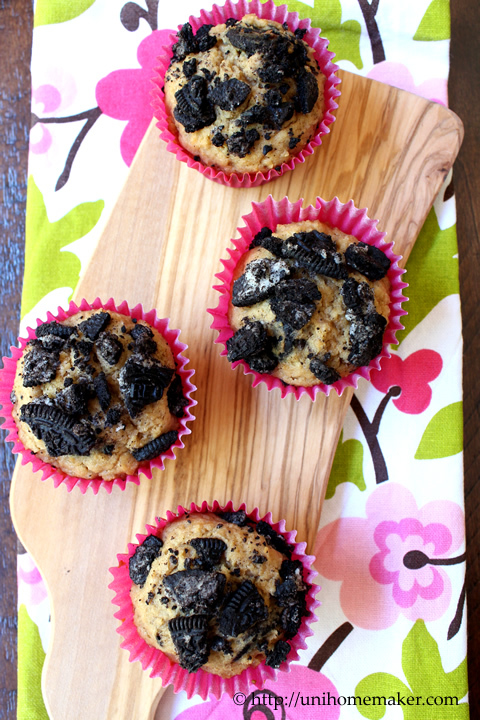 Oreos and Biscoff in one muffin is like heaven! They look wonderful, Anne! Will substituting nut butter for the biscoff spread work? Creamy peanut butter will work great here, that is if you like the combo. I know I do! 🙂 Thanks for popping over Norma. I have the same problem with apple cakes, actually. they leak out far too much water and then the cake becomes a bit too wet. at least it didn’t go to waste (cheers for supportive partners)! Thanks Anne for sharing another of your great recipes. You just made me laugh out loud! I could see myself doing the same thing! In fact, I have. When Justin ended up taking something over to the neighbors. I was mortified…it wasn’t baked perfectly. Well, to my standards. So, I know exactly what you mean. But, these look amazing!!! Pinning! PS…I’ve had my share of flops recently…and even thought the family will still eat most of it, it annoys me when recipes are not blog worthy. Those muffins look absolutely delicious!! Thanks for the recipe. Looks delish. Wish I could have a taste. Maybe next time? What was breakfast? An apple cake? Yes, next time. And yes, it was an apple yogurt cake. I’m glad to know I am not the only 1 who hasn’t tried Biscoff. Sounds like a great combination for a cupcake! If your first recipe tasted like bread pudding, I’m sure I would have liked it! I had two thoughts about your apple cake! 1. Did you cook down the apples a bit before baking the entire cake? That would obviously reduce the moisture. Also, did you refrigerate it? It there was a lot of sugar in the topping, it would most likely absorb the moisture from the fridge, hence the soggy. Good luck next time! I would like a muffin now. I didn’t cook down the apples before baking. And I didn’t refrigerate. I did have a lot of sugar topping though. Oh well… will have to try again. Thanks for stopping by. Oh wow – oreo and biscoff! What a great combo! Oreos and Biscoff are 2 of my favorite guilty pleasures!! SO amazing that you just combined them into one! 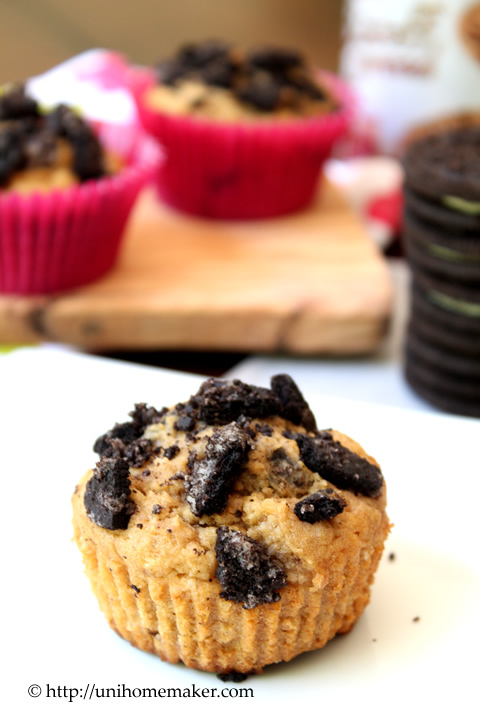 Oh my word, oreos and biscoff in one muffin? These sound amazing! I could go for one as an afternoon snack right about now! Great looking muffins! Love the flavors. It’s not easy finding Biscoff in the US, but it’s around if you look – I need to get some and try these. Thanks so much! I love muffins, too, and these look SO good. So glad they were a huge success! I recently baked a banana bread 3 times! it was still yummy, but i get your frustrations. I’m sorry to hear about your cake mush! But seriously, it happens to the best of us. 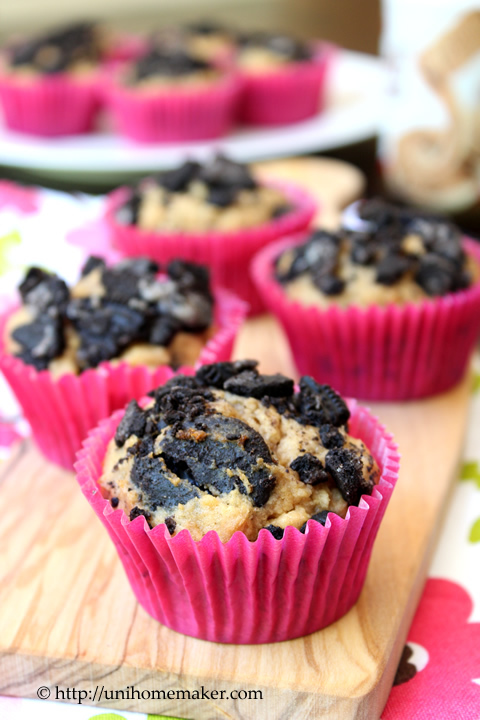 And you definitely more than made up for it with these muffins! BIG yum. They look delicious Anne! I had to look up Biscoff… we don’t have that here. We’re planning a trip to Maine and I’ll definitely have to look for this. 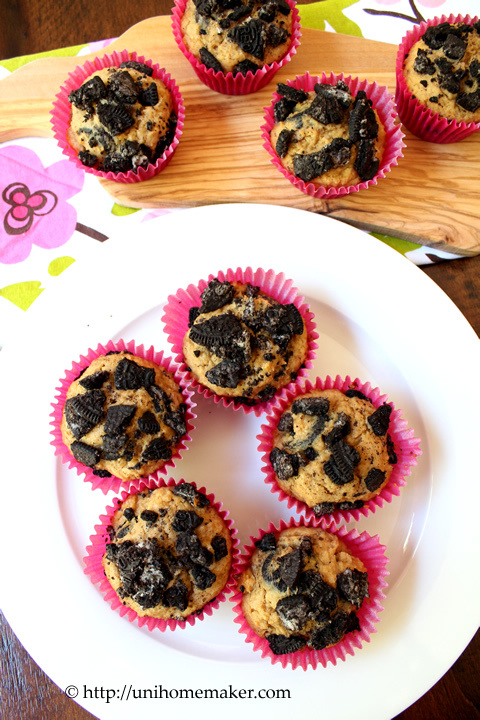 I found you on Recipleaser.com and couldn’t help but click over when I saw these Oreo and Biscoff muffins. Boy do they look gooooood! I’m so going to have to make these bad boys. Especially more so now that I’ve discovered that they finally sell Biscoff here in the UK. Can’t even begin to tell you how long I’ve been waiting for the Biscoffy goodness to make its way here, and now I have a perfect excuse to use it. Bookmarked ready to make soon. Thanks for the inspiration, and happy baking. Hi Lisa, so glad you stopped by! Thanks for the lovely comment. Hope to hear from you again soon! Aside from looking insanely delicious these are SO pretty! I could stare at them and drool all night long! I have a biscoff post for tomorrow – it is some heavenly stuff. Ah biscoff spread. I just recently tried this and am now hooked. In fact, after reading your recipe, I want to go downstairs and eat a spoonful. 🙂 Pinned! 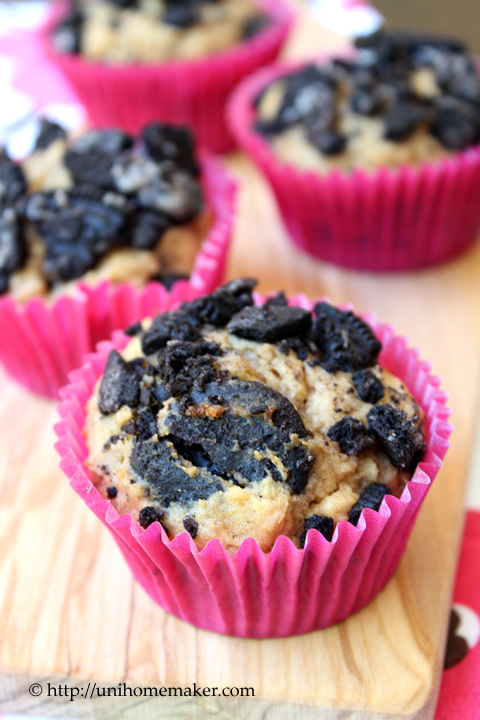 I have been trying new flavors and these muffins look amazing and delicious! Oh… these sound dangerously good! Definitely a good afternoon treat! Glad the second batch came out better. 🙂 Thanks for sharing at Show Stopper Saturdays Anne!